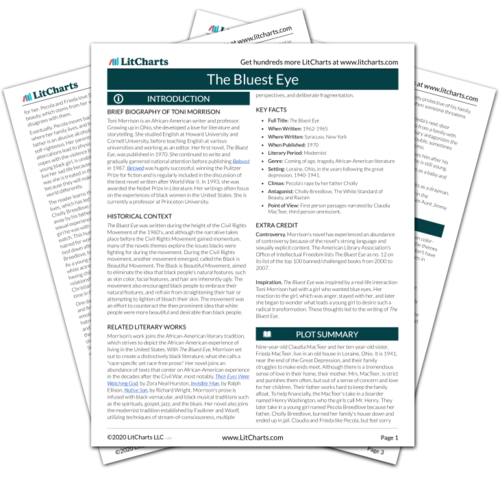 Welcome to the LitCharts study guide on Toni Morrison's The Bluest Eye. Created by the original team behind SparkNotes, LitCharts are the world's best literature guides. A concise biography of Toni Morrison plus historical and literary context for The Bluest Eye. A quick-reference summary: The Bluest Eye on a single page. In-depth summary and analysis of every chapter of The Bluest Eye. Visual theme-tracking, too. Explanations, analysis, and visualizations of The Bluest Eye's themes. The Bluest Eye's important quotes, sortable by theme, character, or chapter. Description, analysis, and timelines for The Bluest Eye's characters. Explanations of The Bluest Eye's symbols, and tracking of where they appear. An interactive data visualization of The Bluest Eye's plot and themes. Toni Morrison is an African-American writer and professor. Growing up in Ohio, she developed a love for literature and storytelling. She studied English at Howard University and Cornell University, before teaching English at various universities and working as an editor. Her first novel, The Bluest Eye, was published in 1970. She continued to write and gradually garnered national attention before publishing Beloved in 1987. Beloved was hugely successful, winning the Pulitzer Prize for fiction and is regularly included in the discussion of the best novel written after World War II. In 1993, she was awarded the Nobel Prize in Literature. Her writings often focus on the experiences of black women in the United States. She is currently a professor at Princeton University. The Bluest Eye was written during the height of the Civil Right's Movement of the 1960's, and although the narrative takes place before the Civil Rights Movement gained momentum, many of the novels themes explore the issues blacks were fighting for during the movement. During the Civil rights movement, another movement emerged, called the Black is Beautiful Movement. The Black is Beautiful Movement, aimed to eliminate the idea that black people's natural features, such as skin color, facial features, and hair are inherently ugly. The movement also encouraged black people to embrace their natural features, and refrain from straightening their hair or attempting to lighten of bleach their skin. The movement was an effort to counteract the prominent idea that white individuals are more beautiful and desirable than their black individuals. Morrison's work joins the African-American literary tradition, which strives to depict the African-American experience of living in the United States. With The Bluest Eye, Morrison set out to create a distinctively black literature, what she calls a "race-specific yet race-free prose." Her novel joins an abundance of texts that center on African-American experience in the decades after the Civil War, most notably, Their Eyes Were Watching God, by Zora Neal Hurston, Invisible Man, by Ralph Ellison, Native Son, by Richard Wright. Morrison's prose is infused with black vernacular, and black musical traditions such as the spirituals, gospel, jazz, and the blues. Her novel also joins the modernist tradition established by Faulkner and Woolf, utilizing techniques of stream-of-consciousness, multiple perspectives, and deliberate fragmentation. Setting: Loraine, Ohio, in the years following the great depression, 1940-1941. Point of View: First person passages narrated by Claudia MacTeer, third person omniscient. Controversy. Morrison's novel has experienced an abundance of controversy because of the novel's strong language and sexually explicit content. The American Library Association's Office of Intellectual Freedom lists The Bluest Eye as no. 12 on its list of the top 100 banned/challenged books from 2000 to 2007. Inspiration. The Bluest Eye was inspired by a real life interaction Toni Morrison had with a girl who wanted blue eyes. Her reaction to the girl, which was anger, stayed with her, and later she began to wonder what leads a young girl to desire such a radical transformation. These thoughts led to the writing of The Bluest Eye. Powers, Jacob. "The Bluest Eye." LitCharts. LitCharts LLC, 21 Dec 2013. Web. 21 Apr 2019. Powers, Jacob. "The Bluest Eye." LitCharts LLC, December 21, 2013. 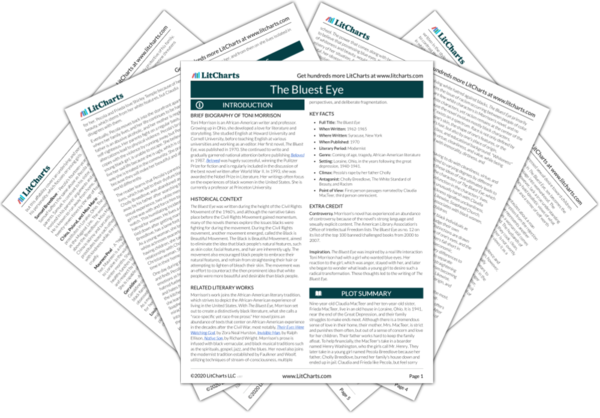 Retrieved April 21, 2019. https://www.litcharts.com/lit/the-bluest-eye.